Welcome to beautiful Esquina, Corrientes, home to the finest Argentina duck, dove, pigeon and Perdiz hunting. We offer these hunts plus big game hunting and Golden Dorado fishing all out of the same lodge. 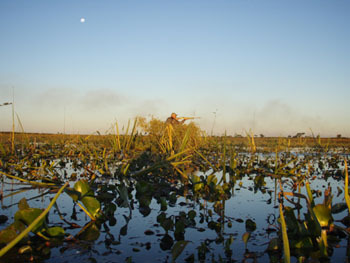 The combination of 2 major rivers, a huge wetland and a variety of agriculture and scrub forests makes Esquina, Corrientes a paradise for sportsmen. Come see why we choose this wildlife mecca as our northern base of operation. Wing Shooting Argentina unites 4-star ranch accommodation and the finest guides in the area. We use two ranches both located outside the small town of Esquina. From these lodges we hunt either on the ranches on neighboring ranches. Esquina is an old fishermen’s town, founded in 1806 by the Spanish. It was destroyed twice during Argentina’s civil war. Its final reconstructed in 1846 was aided by the vital Esquina port which was fundamental in trading agricultural products and other goods between remote areas up the Paraná and Corriente River and the capital of Buenos Aires. It is a place that time forgot and its streets and buildings appear much as they did 100 years ago. Today Esquina is known for the Festival Nacional de Pacu, a 3 day fishing competition that brings roughly 25,000 visitors in March. In January and February the town hosts its own carnival, where lavishly dress women and boys parade the streets dancing and drumming. The town depends on agriculture, forestry, and tourism. two rivers create what locals call the Paraná River Delta. Resembling the Florida Everglades, the delta is a labyrinth of rivers, ponds, islands and floating vegetation. The city of Esquina has recognized the ecological importance of the area by designating a huge chunk of the delta near Esquina a biological reserve. The braided wetlands of the Paraná Delta extend all the way to Buenos Aires. The delta hosts many rare species such as the Marsh Deer, the Capybara, the Neotropical River Otter, the Pampas Cat, the jaguar, Black Caiman, and millions of exotic birds.